If you want to add a cool and contemporary touch to your new kitchen design, then the Feature Black Glazed will do just the trick. This utterly unique feature doors are a sharp and slick addition to your kitchen, which are every inch as practical as they are impeccably stylish. The feature black glazed kitchen design adds something modern and fun to your kitchen. The kitchen doors, which are a tinted glass with a cool metal frame, have the handy practical element of being slightly sheer so that you can see behind them. However, the tinted glass still adds a classy feel to the design, offering a more sophisticated end result than your more classic glass. Framed with a thick, black, more opaque section, the feature black glazed kitchen doors have a design which instantly draws your attention when entering the room. 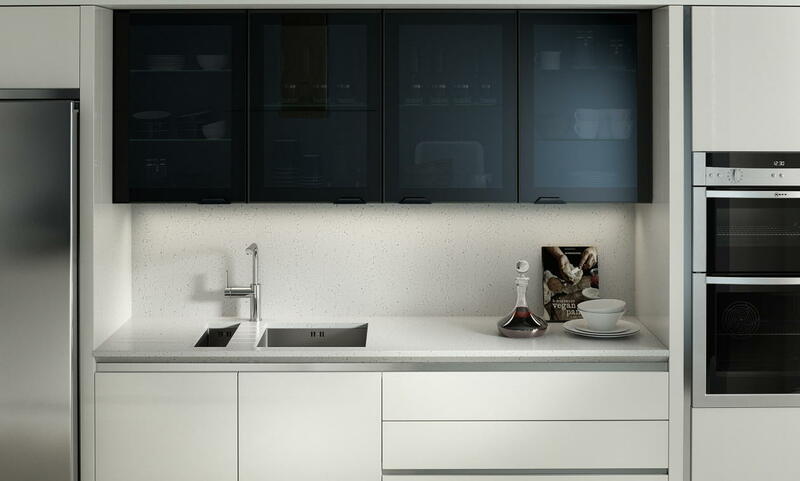 The best part about the feature black glazed kitchen design is the versatility of the colour palette. Black goes with anything, which means you can be completely creative with how you choose to style the rest of your kitchen. Whether you want glossy white surfaces to contrast with the black feature doors, or a similar dark colour for a deep overall hue in your kitchen, your feature black glazed kitchen design will work perfectly. Finished with a subtle handle design that’s attached to the bottom of the door, the handle doesn’t distract from the glass door whatsoever, placing the emphasis on functionality rather than style, and allowing the design of the feature black glazed door to do the talking. Working your feature black glazed kitchen design into your home couldn’t be easier. Thanks to Number One Kitchens, Manchester’s number one kitchen experts, you could be looking at these gorgeous kitchen doors within your home in a matter of weeks. Why not get in touch for a quote today and start your journey to your dream home in an instant?